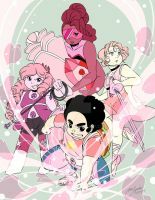 Rose Quartz fusions! From left to right! Fluorite look like Ursula from "The Little Mermaid"
I just love how in all of the fusions Steven is there all proud like: "Yup that's my mom!" These would have been awesome fusions to see on the show! My Favorite one is the Amethyst and rose fusion. Um, Rose Quartz + Pearl is actually Rainbow Quartz. did you check the date? Said is what you could say has dou-hong for my request if I can set opalite so that I draw her? uhh... what? I didn't understand that. I said said is what you could say has dou-hong for my demand(request) if I can set opalite and aqua marinate so that I draw them? Yes. I know, as I do watch the show. This was made before Rainbow Quartz was first shown. Those are pretty good Rose Quartz fusions. this is the coolest idea everrrrrrr. love it! Flourite looks like a hot anime punk, rock star vampiress. Cool! Because I do not arrive has to communicate with him. Said is what you could say has dou-hong for my (request) if I can set opalite and also aqua marinate so that I can draw them? Why thank you, I appreciate that! Yes, RQ is a beautiful fusion! I love amethyst - rose's design!! Look at the release date of the picture.. This was made in May.. Before Rainbow Quartz was announced. Wow, you are.. unnecessarily rude. Also, in my opinion this version of the fusion is waaayyyyy cooler. It's just so, dang, COOL. You're being more rude than me. I was just saying I didn't care about this chat anymore. Oh okay, it's just that it seemed like you were yelling. How was I more rude exactly? I only said I didn't care about this chat.